Do you want to do well on your calculus exam? Are you looking for a quick refresher course? Or would you just like to get a taste of what calculus is all about? If so, you've selected the right book. Calculus and Pizza is a creative, surprisingly delicious overview of the essential rules and formulas of calculus, with tons of problems for the learner with a healthy appetite. Setting up residence in a pizza parlor, Clifford Pickover focuses on procedures for solving problems, offering short, easy-to-digest chapters that allow you to quickly get the essence of a technique or question. From exponentials and logarithms to derivatives and multiple integrals, the book utilizes pepperoni, meatballs, and more to make complex topics fun to learn-emphasizing basic, practical principles to help you calculate the speed of tossed pizza dough or the rising cost of eggplant parmigiana. Plus, you'll see how simple math-and a meal-can solve especially curious and even mind-shattering problems. 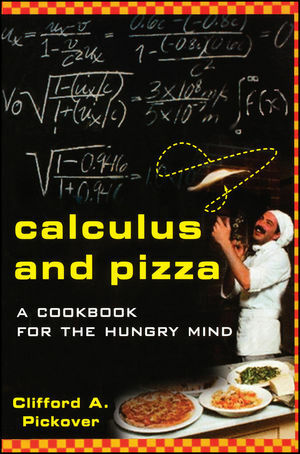 Authoritatively and humorously written, Calculus and Pizza provides a lively-and more tasteful-approach to calculus. "Pickover has published nearly a book a year in which he stretches the limits of computers, art, and thought." "A perpetual idea machine, Clifford Pickover is one of the most creative, original thinkers in the world today." CLIFFORD A. PICKOVER is a research staff member at the IBM T. J. Watson Research Center. He is also a prolific author of books and articles relating to science, art, and mathematics, including Black Holes: A Travelers Guide and Keys to Infinity, both from Wiley. Pizza Velocity and the Derivative. Rules for Products and Quotients. Logarithmic Differentiation, Integration by Parts, Trigonometric Substitution, and Partial Fractions.